Bio Notes: Robert Hamilton Paterson (his surnames were not originally hyphenated) was born in Edinburgh in 1843, the son of Thomas Paterson, architect to the Duke of Hamilton's estate, and younger brother of John Paterson (1832-1877). He was educated at Hamilton Academy and was articled to James Turner of Hamilton, a branch office of the Dublin firm, followed by experience in an unspecified office in Edinburgh and with Cubitt & Co in London. In 1870 Paterson married Elizabeth Cullen in Hamilton and that summer they moved to Edinburgh where he commenced practice. They are mentioned in the session minutes of Newington UP Church of which Paterson's cousin, Robert Paterson (1825-1889) was both architect and session clerk. From his earliest years he made a special study of the architectural and engineering requirements of brewers, maltsters and warehousemen. For some twenty-five years he held the position of architect and surveyor to the Police Commissioners of the County of Lanark. In 1898 Hamilton-Paterson took into partnership Thomas Duncan Rhind (born 1871), with whom he is said to have studied; this partnership was short-lived, being dissolved about 1905. 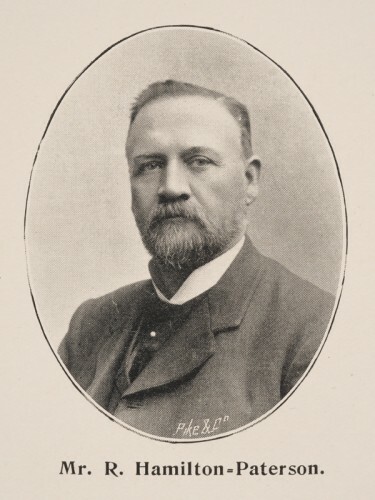 Robert Hamilton-Paterson died in 1911 at the age of sixty-seven years. Long widowed, he was survived by two daughters, of whom one lived in Edinburgh and the other was married in South Africa. Thomas Tolmie Paterson continued the practice thereafter but the Finance Act of 1909 had an adverse effect on it and he emigrated to Canada sometime after that. John Peter Dippie Grant 1907 c. 1909 Apprentice Though John Petrie Dippie Grant states that he was apprenticed to Hamilton Paterson & Paterson it was probably Hamilton Paterson on his own. 1892 Caledonian Brewery Edinburgh Scotland Reconstruction, new brewery, maltings, etc.